When tissues and organs are replaced with prostheses it is not uncommon for all sorts of complications to arise. The Laboratory for Cell & Tissue Engineering facilitates research on the culturing and engineering of the patient's own - or autologous - cell tissues. The technologies developed here enable new tissues - such as cartilage, intervertebral discs, blood vessels, heart tissue and organ tissue - to be grown inside the patient's body. Blood vessels may seem like simple tubes that carry blood from A to B. In fact, this is an active, living system in which muscle cells contract and expand the vessel walls. In similar fashion heart valves and other tissues must be capable of bearing various forces. The steps involved in culturing and studying these tissues in a laboratory are many and varied: from culturing cells and producing carrier materials, to tissue analysis and testing. For these tasks, the Laboratory for Cell & Tissue Engineering provides the necessary specialist knowledge and pioneering equipment. The Laboratory for Cell & Tissue Engineering is an ultramodern laboratory. The research that takes places here extends across the full spectrum of the field of tissue engineering. Facilities include a fully equipped cell culture room ideal for elaborate experimental tissue engineering. Tissues are tested exhaustively for their mechanical properties and durability. Also the carrier materials, on which the cells are deposited to form tissue, can be made here. 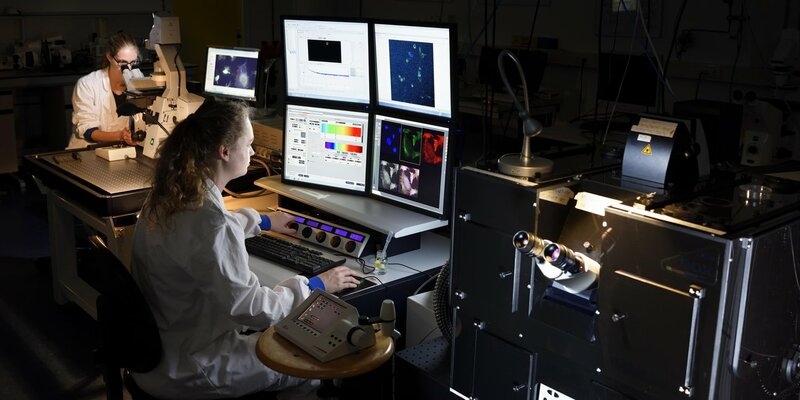 A fully blindable microscopy room is equipped with state-of-the-art confocal and fluorescence microscopes for the detailed analysis of cells and the tissues formed. The research facilitated by the laboratory has produced various successful spin-offs. The renowned iValve project led to the development of biodegradable heart valves capable of selectively attracting cells from the blood stream. Through this selection process a heart valve made of the body's own material is created; unlike artificial heart valves this never needs replacing. The first biodegradable heart valves, developed by the TU/e spin-off Xeltis, were inserted in patients in 2016. It is primarily the laboratory's breadth of activities that makes it unique in the Netherlands. Every step in the research process - from the development of carrier materials to the analysis of the tissue grown - is catered for. All this is facilitated by innovative facilities; the laboratory optimally uses the technological developments offered by TU/e. Since various research groups within the Department of Biomedical Engineering use these facilities, a rich cross-fertilization of ideas and knowledge takes place. This creates a unique breeding ground for innovations. The laboratory is used mainly by research groups and the research partners of the Department of Biomedical Engineering. The spin-offs arising from this research also enjoy access. The laboratory is not available to external parties.